inscription: Pond Farm "F" "W"
Per S.B. 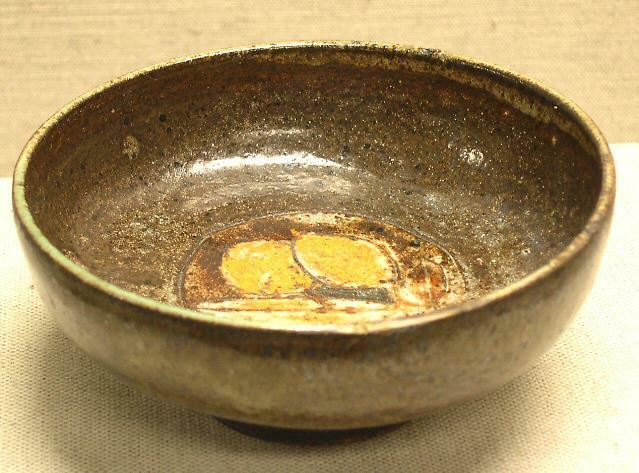 - Footed low dish; stoneware. Glaze is primarily dark brown. Inscribed circle encloses fruit and leaf motif in light orange and white. Verso: Inscribed "Pond Farm" inscribed plus mark (jug outline); inscribed letters "F" and "W" may stand for chemicals in clay, such as iron and manganese.